Broadcast2world delivered their 1500th animated explainer video in the second quarter this year making them one of the most popular professional animated video production companies in the global playing field. The company is expected to close $1 million worth of business this financial year. I feel proud having achieved this milestone figure. It sets us apart as a market leader in this industry. Broadcast2world, a company that produces short animated videos for products, marketing, and promotion, delivered their 1500th short animated video this second quarter ending September. Looking at the efforts involved and time taken to produce each video, this is a significant number for any professional video production unit and reflects the popularity of their services with a lot of repeat orders coming in from various clients. Broadcast2world has delivered animated explainer videos for a diverse portfolio of clients ranging from fortune 500 companies to small businesses. Clients include NAASCOM, Nokia, Ibibo, Snapdeal, Zoho, authorSTREAM and WizIQ. On the occasion, the Managing Director of Broadcast2world, Sunny Arora expressed, "I feel proud having achieved this milestone figure. It sets us apart as a market leader in this industry." Broadcast2world started operations in November 2009 from their facility in New Delhi, India and have focused exclusively on short animated video production. SAAS (software as a service) startups have been their primary segment, which typically offer web-based services in the form of web apps and online tools, education portals, networking sites, and business and productivity software. Other segments include legal and financial services, health services, shopping deals websites, recruitment services, online retailers, advertising and marketing, web design and graphic design companies, non-profit organizations and recently, mobile apps and books. According to estimates from their business development team, Broadcast2world is all set to close business worth $ 1 million this financial year. 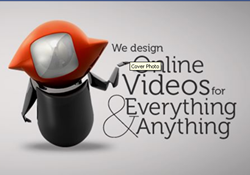 Broadcast2world is a pioneer in animated video production and has produced 1500 videos till date for its direct clients and partners across the globe. The company has a highly specialized team of motion graphic artists and video professionals, who handle each video with meticulous care and perfection. Broadcast2world’s short animated videos clearly communicate the value proposition of a business in a simple, fun and engaging way. The company enjoys a strong client base ranging from startups and SMEs to fortune 500 companies. For more information, you can visit the website at http://www.broadcast2world.com.